Last year, we spent Thanksgiving with Mr Faraway’s family, but though he and I have chatted from time to time, there is no such invitation this year. I’ve also not heard from the friend I hosted every Thanksgiving for ten years, but since she made other plans last year, I assume we’ve both moved on, too. In fact, I’ve heard from no one. There are probably options, but after The Child and I discuss the matter, the only thing that either of us can come up with that will be missed about Thanksgiving is this: my stuffing. I’ll miss it, but the idea of not only not hosting Thanksgiving, but skipping it entirely, is strangely liberating. This year, there will be no leftovers that linger for too long; this year, we will not suffer through the miserable sameness of the menu. No matter what new side dish or pie you make each year, no matter where you eat or with whom, Thanksgiving is always the same. Except this year. I make reservations at a local seafood restaurant, and though I feel slightly guilty that someone will work that day so that I don’t have to, I remind myself that many college students are waiters and appreciate the extra income that guilty, generous people like myself leave on such a day. I resolve to leave a big tip, and with that, am relieved of both my guilt and my obligation to eat turkey. Not having to make room in my fridge for a turkey has some huge pluses, but mostly this one: I can keep cooking food from all the fun, new cookbooks that the library let me borrow, even though I’ve developed an unfortunate habit of keeping their cookbooks far too long. The most recent book is Yotam Ottolenghi’s Plenty More . I wasn’t sure if I wanted to bother with a book about nothing more than vegetables, since I attempted Ottolenghi’s last cookbook when The Child was still a vegetarian, and without much success. It wasn’t a bad book, but I didn’t get excited about it, probably because I was tired of hunting out and cooking things that she could eat, but wouldn’t. 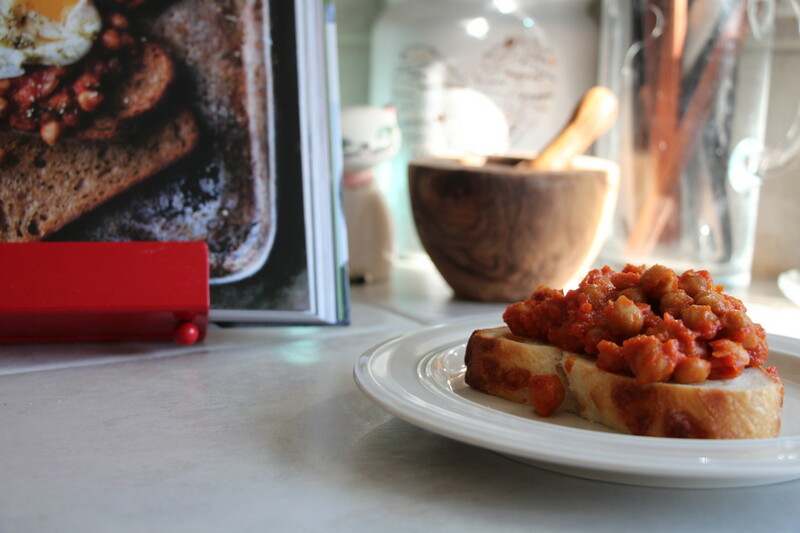 I was much more excited with the recipes in Plenty More , especially this recipe for slow-cooked chickpeas – partly for the chickpeas, but mostly because I’ve lately become obsessed with anything served open-faced on toast, preferably with a soft-boiled egg on top. I ate Smitten Kitchen’s Spinach and Smashed Egg Toast every night for a week, and only stopped making it because I ran out of fresh spinach and didn’t have time to go to the store. The supermarket lines are long and slow this week – what with all those people buying turkeys – so a recipe that can be cooked from the pantry is ideal. This recipe requires a bit of planning ahead, since you need to soak the chickpeas overnight. Don’t try to substitute canned, because you need dried chickpeas to withstand the long, slow simmer that infuses them with flavor. I did substitute canned tomatoes for the fresh tomato Ottolenghi calls for; use fresh if you like, but canned will save you a trip to the store and after five hours of cooking, you’re not likely to notice any difference. The long, slow simmer is perfect for a winter weekend, and rewards you at the end with a nicely spicy, savory bean stew that is thick enough to sit politely on a piece of toast while being held and eaten. I was so enthralled with the spicy-bean-on-toast combo that I forgot all about the poached egg that Ottolenghi suggests and the soft-boiled egg I was planning (follow the Smitten Kitchen directions in the link above). The beans don’t need anything else, and they rewarm perfectly for a nice lunch the next day. Unlike turkey, they probably won’t last much longer than that in your fridge, and also unlike turkey, there’s no stuffed feeling, even if you have a second helping. Drain and rinse the chickpeas and place them in a large saucepan with plenty of water. Place over high heat, bring to a boil, skim the surface, and boil five minutes. Drain and set aside. Place the oil, onion, garlic, tomato paste, cayenne, paprika, red peppers, 1 tsp salt, and some black pepper into a food processor and blitz until a paste forms. Place the paste into a large saucepan and fry for five minutes, stirring occasionally, then add the tomatoes, sugar, chickpeas, and 1 cup water. Bring to a low simmer, cover the pan, and cook over very low heat for four hours. Stir every so often and add water if needed to maintain a sauce-like consistency. Remove the lid and cook for a final hour, allowing the sauce to thicken without the chickpeas becoming dry. Place a piece of grilled toast on a plate and top with the chickpeas. If you like, you can top this with a poached egg drizzled with a bit of olive oil and za'atar.